If you are looking for an easy and comfort way to explore Vienna, here is the Viennese sightseeing bus HOP-ON & HOP-OFF that allows you to get on or get off as many times as you wish. Whether you want to discover Vienna completely or you would like to enjoy just some attractions, with HOP-ON & HOP-OFF you can create your own tour. Visit our office to learn more! Let´s explore Vienna with our guides! Just let us know and we prepare you an unforgettable experience, in which you learn Vienna from all points of view. Red line: Discover the most famous sights along the Ring road such as the State Opera, the Imperial Palace, the Parliament or the National Theatre. Blue line: Explore all highlights on the Danube route such as the Hundertwasserhaus, the Prater with its Giant Ferris Wheel or the Danube Tower. 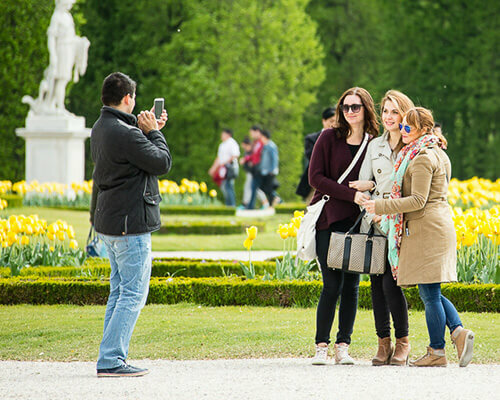 Yellow line: Enjoy a bit further monuments such as the Schönbrunn Palace, the Fruit and Flower Market, the Museum of Military History or the Belvedere Palace. Green line: Take a trip to Vienna’s green surroundings, the wine growing village Grinzing and explore the marvellous view from Kahlenberg and the Klosterneuburg Abbey. Point of Sale: Tickets can be purchased in all our branches. children´s channel in German and English.